You can now add a counter as part of your form for things like invoices and work orders. Many of our customers use Device Magic to supplement or replace an existing process within their business. Two simple examples would be creating work orders and POs by filling out a Device Magic form. Since many of these businesses have an existing work order and/or PO number sequence in place it has been hard to continue that number sequence while completing forms with Device Magic...until now. 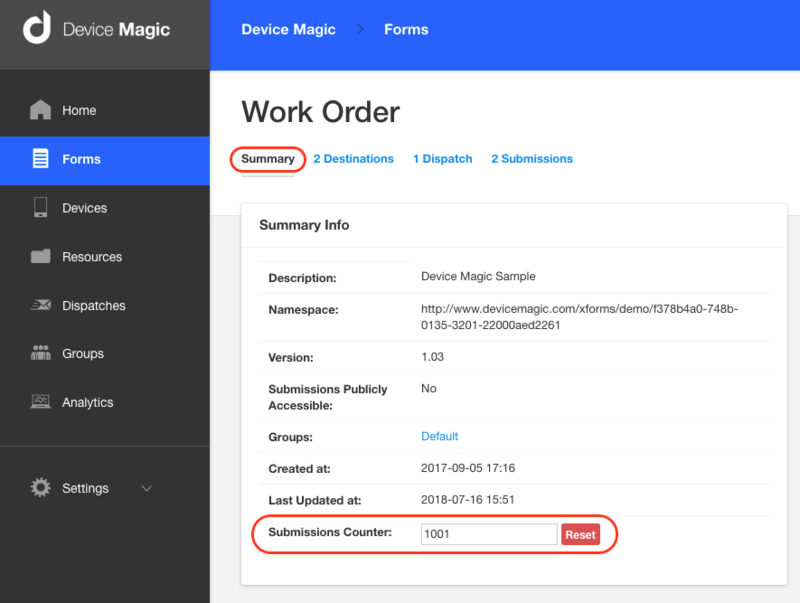 We have included a submission counter as part of the form details within Device Magic. You can find it on the Form Summary page for each form on your Device Magic Dashboard. (You can find it in the red outline below). Let's say you are using Device Magic to replace your current Work Order process but want to have Device Magic pick up where your previous process left off. 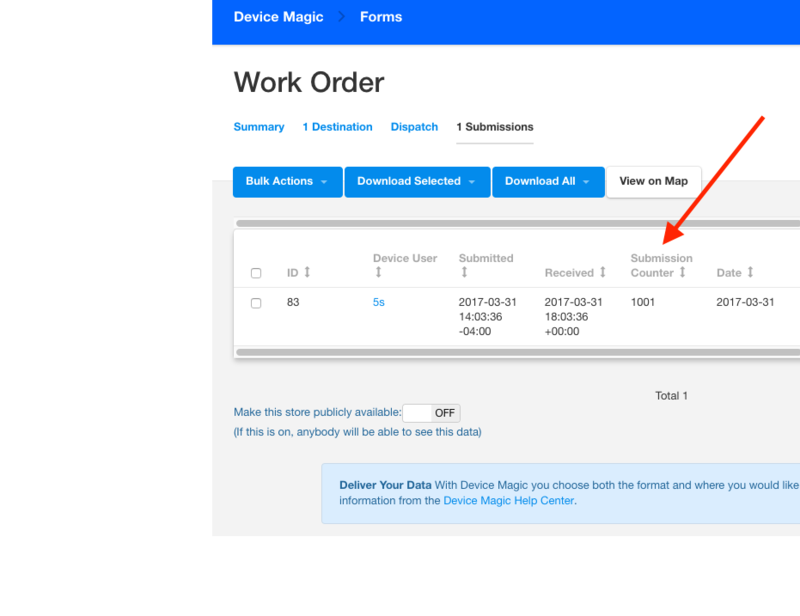 For example, if your last work order number was 1000, you can set your new Device Magic work order form to pick up at 1001 by setting that number in the Submission Counter (see example in screenshot above). 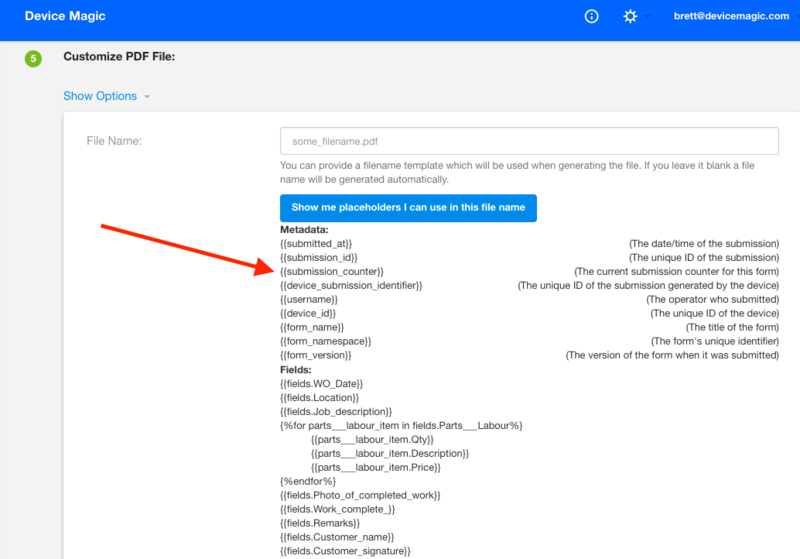 Now, every time someone on your team submits a new Work Order form, the submission counter number is included as part of the meta-data of the form along with other meta-data like the device user, submitted time, and received time. Your submission counter number also appears as a placeholder so you can use it when you create custom PDF and Word documents you send to your customers or internal staff. Check our our Help Center section for more information about how you can use your submission counter number (along with other answer data from your form) to create customized PDF and Word documents. If you have any additional questions, feel free to reach out to our Support Team at support@devicemagic.com.